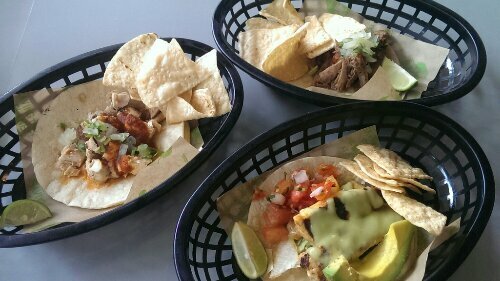 Baja Fresh @Bras Basah Road (Singapore) | Get Your Grub On! It was getting pretty late for lunch and I needed a good idea for something somewhere around the Orchard area that would appear satisfying enough. I remembered a colleague telling me that he often gets the ‘Burritos‘ at ‘Baja Fresh’ and since they also have tacos I started my Saturday activities by heading their way. I instantly was a bit skeptical because of the ‘Subway‘ look-alike setup of the shop but now that I had already come all the way out here in the burning sun I thought “what the heck” and ordered three different flavors, ‘Grilled Mahi Mahi‘, ‘Char Siew‘ (Pork) and ‘Chicken‘. I received a complimentary portion of nacho chips and while they were preparing my food I made my way for the condiments taking samples from the different salsas and loading up on chopped cilantro. Only a few minutes later I had all my tacos sitting in front of me. Because I love fish tacos I started with the mahi-mahi which sadly didn’t taste nice at all. It was unpleasantly fishy which overpowered all other flavors. The chicken tasted like nothing really but at least the pork taco gave me some sort of satisfaction. The meat had been slow cooked tenderly and was pretty juicy so that this was the only one I actually had to use the second tortilla – that came with all tacos – to avoid it all ripping apart. This one was really good even though the tortillas were generally too dry and starchy which I counter fought by adding heaps of the ‘Baja Salsa‘ that had a mild heat and a char tang of grilled peppers. Well, unfortunately this was rather disappointing and as ‘Lucha Loco‘ as well as ‘MexOut‘ have some tastier tacos to offer and one of them even cheaper, ‘Baja Fresh’ probably won’t see me again too fast.